So, this summer I purchased and assembled a Shapeoko2 because CNC machines are really cool. From the perspective of a professional, the whole kit is full of compromises like the delrin wheels, the fake Dremel hand tool, and the Arduino controller. 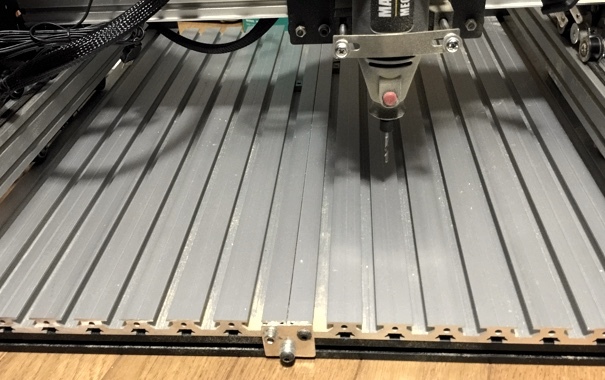 Most of these compromises are fine for an entry level desktop CNC that machine that is not in heavy use and used with only lighter materials. After my first project, it was pretty obvious that the worst compromise was the stock MDF bed (followed closely by the fake Dremel). The MDF bed may be cheap, easy, and relatively light but the two panels of the bed flexed under the slightest pressure and were nowhere near strong or stiff enough to provide a stable cutting platform. One post in the Shapeoko forums showed a particularly nice aluminium bed with extrusions (HFSQN4-15250-500) from Misumi that happened to be sized perfectly to fit the stock Shapeoko. Luckily, Misumi is a Japanese company and I quickly placed an order for the extrusions and corresponding nuts for the T-slots. After installing the extrusions buckled upwards ever so slightly. To eliminate the buckling I made two brackets out of aluminium, tapped holes into the extrusions, and bolted them down to the existing t-slot crosspieces. It's not a permanent solution but for now it's amazing how much the extrusions stiffened up the whole machine and greatly increased the overall precision. Next on the list, some nice work holding clamps to go with the T-slot extrusions.